A Boeing B-17E in flight. Strategic bombing missions had properly begun during World War 1 and the post-war years saw a number of world powers working on the development of state-of-the-art bomber fleets. During the month of August 1934, in anticipation of rising tensions in the Pacific, the US Army Air Corps proposed a new multi-engine bomber that would replace the outdated Martin B-10. This was to be the B-17 Flying Fortress whose primary purpose would be to reinforce bases in Hawaii, Alaska & Panama. Enter the B-17 Flying Fortress. 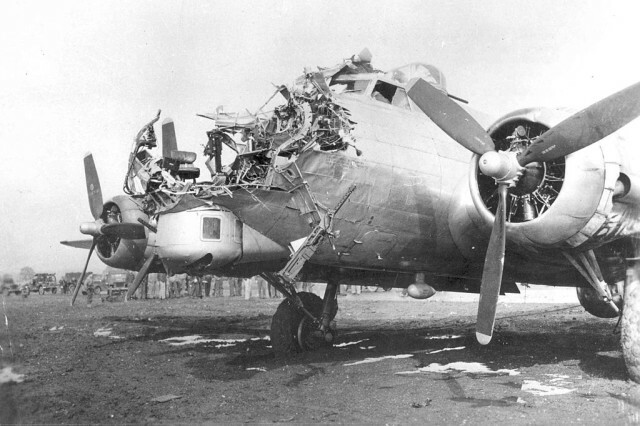 Boeing competed against both Martin and Douglas for the contract to build 200 units of such a bomber but failed to deliver as the first B-17 Flying Fortress crashed. The Air Corps loved the design so much that they ordered 13 units for evaluation and analysis. After a string of tests, it was introduced in 1938; the B-17 was now the prime bomber for all kinds of bombing raids. A U.S. Army Air Force Boeing B-17G-50-VE Flying Fortress dropping its payload during WWII. The prototype B-17 Bomber was built at the company’s own expense and was a fusion of the features of Boeing XB-15 and Boeing 247 Transport Aircraft. Initially, it could carry a payload of 2200 kg along with 5x .30-inch machine guns. The 4x Hornet Radial Engines could produce 750 HP at 2100 meters. 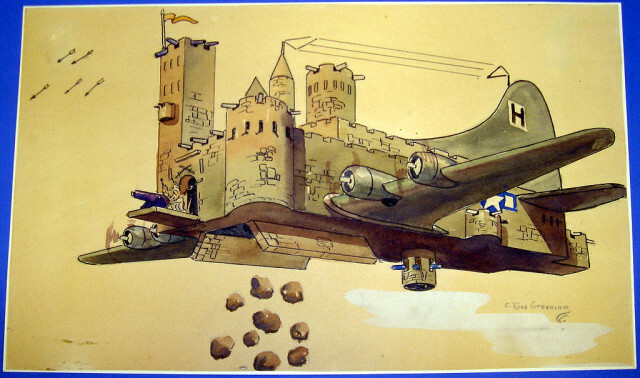 The name Flying Fortress was coined by a reporter of the Seattle Times and from there on became the trademark for Boeing. The company lost the tender because the model crashed but the Air Corps designated a special F1 Fund for the procurement of 13 B-17s on an experimental basis. 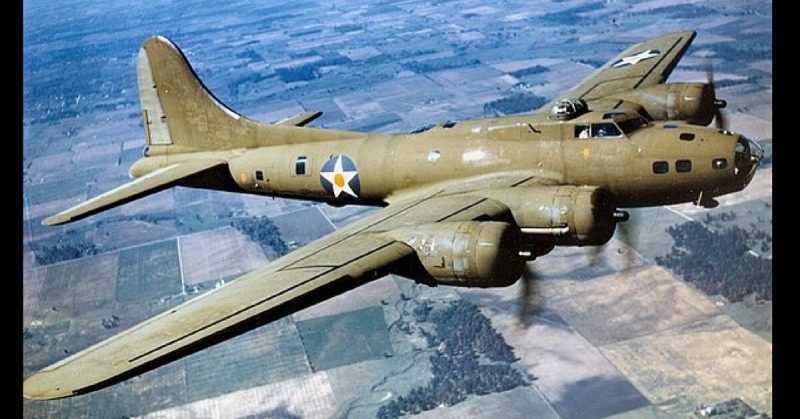 The B-17 Flying Fortress was used in every single World War II combat zone and by the time production ended in 1945, Boeing along with Douglas & Vega had built 12,731 bombers. 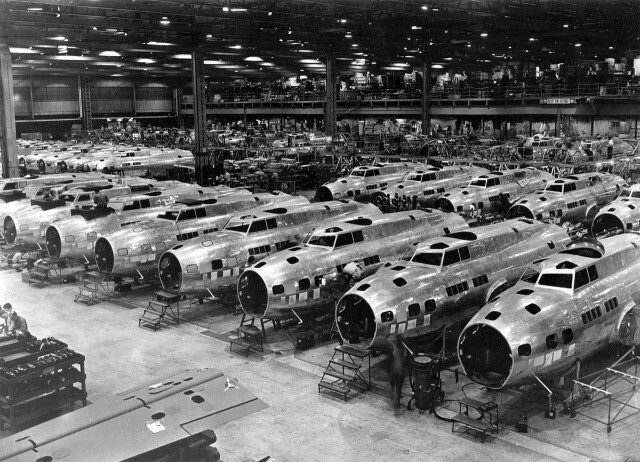 Boeing B-17Es under construction. This is the first released wartime production photograph of Flying Fortress heavy bombers in production. September 6th, 1943, 400 bombers sent out to attack a ball-bearing plant, 45 were lost. 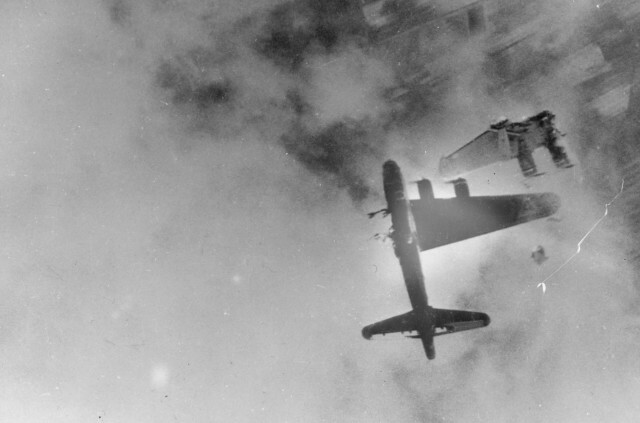 October 4th, 291 B-17s sent to the same location, 60 were lost. January 11th, 1944, 600 B-17s sent to various industries. Bad weather brought down this number to 238 out of which 60 were lost. 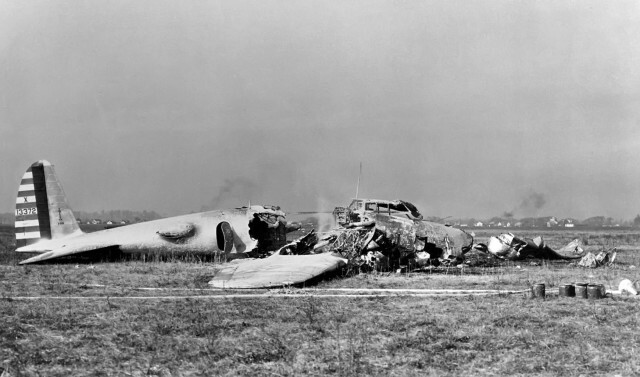 The Luftwaffe found that attacking the B-17 Flying Fortress head on proved more fruitful and therefore the Americans developed the term “Bandits at 12 O’ Clock High” for oncoming Luftwaffe fighters. A single B-17 Flying Fortress would cost US$238, 329 in 1945. Although various models of the B-17 Flying Fortress were produced, the B-17G was the one that was liked the most. 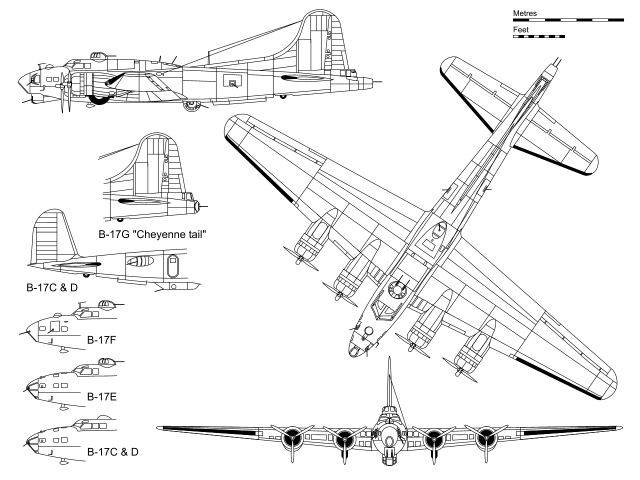 Almost 9000 B-17Gs were produced, the most of any variant because of their superior specs. A B-17G weighed 65,000 pounds and could cruise at a speed of 150 mph, peaking at 287 mph. It could attain a service ceiling of 35,600 feet, and carry a 9600 pounds payload. The 4x Wright R-1820 Cyclone engines could produce 1200 HP each! One particular B-17 Bomber survived a bombing mission and flew back to safety with 180 flak holes and only 2 out of 4 engines. 75 years later, the veteran wrote a thank you letter to Boeing. During World War II, almost 25 B-17s were fitted with radio controls & cameras, filled with 20,000 pounds worth explosives and named Aphrodite Missiles. 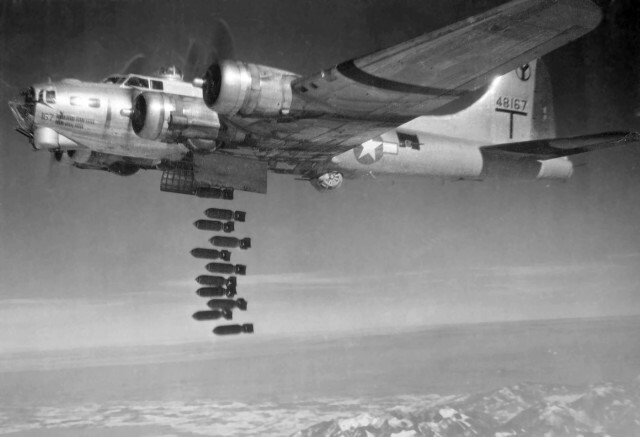 Subsequently, Operation Aphrodite was launched, during which the US Airforce carried out a precision bombing against bunkers and hardened enemy targets. Initially, the operation was a success but as a whole, out of the 14 missions flown, none could completely neutralize their respective targets. During the month of January 1943, the Allies decided to carry out the Combined Bomber Offensive against the Germans. The B-17 was chosen by the Americans while the British primarily chose the Wellington or Lancaster bomber. The US would attack during the day while the British would carry out operations during the night. The result was severe damage to Nazi morale as well as to the capability to fight back. The Luftwaffe fighters managed to inflict considerable damage to the bombers but they never really recovered to their previous glory. 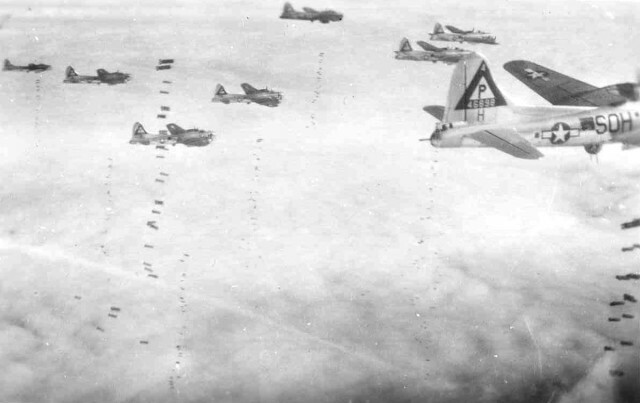 B-17s on a bombing run. After a detailed analysis of the fighter attacks on B-17s, it was found by the Germans that on average about 20 hits with 20mm shells were required to bring down a B-17. During the war, pilots could only hit with 2% accuracy so a pilot had to fire almost a thousand rounds before a bomber could be brought down! A B-17 shot down by Me-262. Almost 40 B-17s were captured by the Luftwaffe. They were re-painted and used by the Luftwaffe for training exercises. In addition, they were reverse engineered to improve existing German bombers. Similarly, the Soviets acquired B-17s that had landed in their territories due to mechanical failure and by 1946 they had reverse engineered both the B-17 and the B-29 to produce their very own Tu-4. After the war ended, many B-17s were converted into commercial aircraft and purchased for VIP transport and rescue missions. Still, B-17s were used during the Korean War and for analyzing nuclear mushroom clouds for experimental purposes. The B-17 was operated by almost all countries either militarily or commercially in Asia, North America, South America and Europe due to their versatility. The last airworthy B-17 left in Europe is known as Sally B. It is now based in Imperial War Museum in Duxford, England, and still flies at airshows across the UK and Europe. The aircraft saw limited action during WWII as it was delivered too late in 1945. It is actively used during film shoots & newsreels. In the USA there are more flying examples.